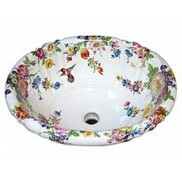 Floral designs are a staple of the decorated bathroom and flowers have been hand-painted on sinks for hundreds of years. We’ve got enough traditional designs to complement any decor and flowers to suit every one of your tastes. Give your powder room Victorian charm with the Chintz or Scented Garden or create a Country French inspired bathroom with the Blue Amaranth or Iris design. 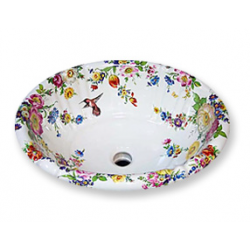 Almost all of our Traditional Florals can be adapted to almost any style of sink or toilet. Walk into a fragrant flower garden bathroom or powder room with this versatile Dresden-style floral .. Painted drop-in bathroom sink with the Scented Garden design. Lots of beautiful colors and flowers i.. This is basically the same as the Scented Garden with Hummingbird but this one includes a gray hummi..
You'll think of a fragrant flower garden when you walk into the bathroom with this versatile Dresden..
Scented Garden floral design painted on a petite pedestal sink. Flowers include tulips, roses, poppi..
Scented Garden design painted on a larger traditional pedestal sink. Bouquets of flowers adorn the b.. Complete your painted bathroom with the Scented Garden design painted on the toilet tank and lid.&nb..
Add a splash of color to your toilet too with the Scented Garden design painted on the toilet tank a..
Another version of the Scented Garden, this time with a little less of the design on the baisn. 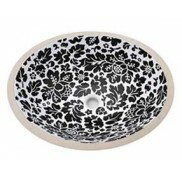 Incl..
Customize your bathroom with this beautiful Victorian Garden drop-in sink. Colorful selection of flo..
Add a splash of color to your bathroom sink with this Victorian Garden design. 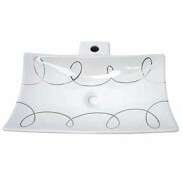 Four different b..
Add some romance to your bathroom basin with the Victorian Garden design painted on a decorative ves.. This is the Victorian Garden design on small white undermount. Beautifully painted flowers which inc..
Textural and fabric-like in gray on white, (shown here) white or light blue... really makes an impac..